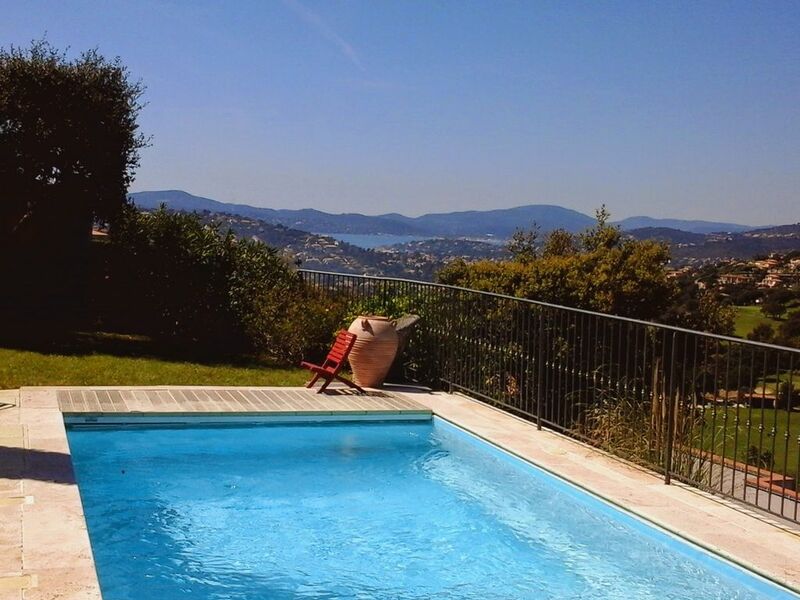 ideally located, all facilities, recent building 2001, very peaceful, real countryside large view on the golfe of Saint Tropez and the Golf courses of Ste Maxime (hole 18). Easy to come to the Beach 2.5 km (around 40 mm by walk). "Very nice and warm welcome from Mr and Ms VAYSSIERES, who came from Paris to hand over the property for the first tenants ever. House is really nice and well equiped, lots of space everywhere for relaxing. Good view over the golf course onto the sea (St. Tropez is easily visible). The suroundings are pretty - walking to Saint Maxime takes roughly 45 minutes so a car is important to have. We spent an excellent holiday with friends also thanks to Mr and Ms VAYSSIERES." This was the fourth year we have holidayed in this area, each one arranged through this website, and I can recommend this villa. It has very good access, parking, it's in a peaceful neighbourhood and has excellent views across the golf course and out to the sea. We just loved sitting on the patio in the evenings, with a glass of wine of course! looking out over the views. The villa itself is spacious, well equipped and nicely presented. I found the owner was very helpful, professional and easy to deal with, always reassuring to know when you are dealing direct. There is lots to experience in Ste Maxine and the surrounding area, whether you like siteseeing, great restaurants, the beach - La Nartelle is only 5 minutes away by car, or sailing the Golfe de St Trooez - the centre in Les Issambres (10 Minutes by car) offers lessons or rentals. With in easy access you can visit medieval towns such as Grimaud, Mougins, Eze or St Paul de Vence ( we haven't trekked west yet!). My family enjoyed a lovely 2 weeks in this villa and we would consider this one again when we return. Thanks you very much. My wife and I, we are very pleased about your few lines , all your comments give us a great desire to discover the village all around Ste Maxime which you seems fall in love. Many thanks for your appreciations about our villa and hope to see you very soon again. Villa agréable à vivre, au calme et bien sécurisée pour les enfants. Nous nous réjouissons déjà d'être en juillet 2016. "Très calme car dans un impasse, la maison est toute équipée. Les propriétaires sont très accueillants et proposent la location de draps/serviettes, lit bébé, etc. "Sehr schönes Haus mit allem Komfort, viel Platz, sehr schöner Garten, sehr schöne Aussicht, Vermieter sehr hilfreich (besorgt sogar Lebensmittel für den ersten Start und organisiert auch Endreinigung). Sehr schöne Ferien, die voll unsere Erwartungen erfüllt haben." By the A8 motorway, Exit Le Muy direction Sainte Maxime , then the Golf, then domain : les Hauts du golf .